← EUBTC : R6 : Belgium goes for broke against Turkey. 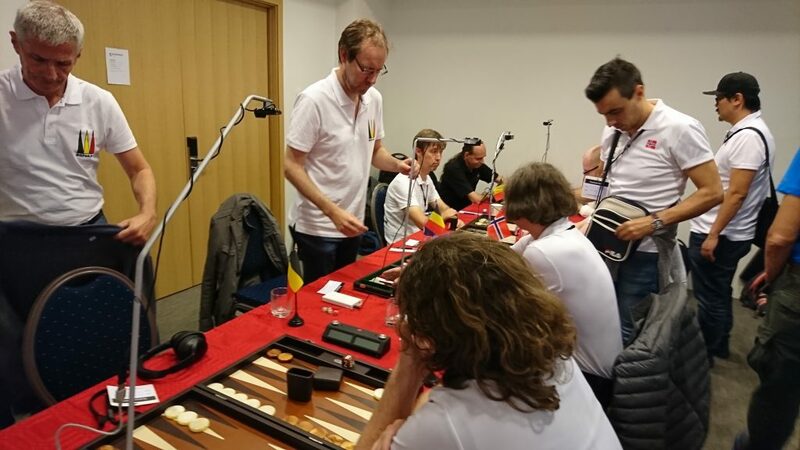 In Reykjavik last week, the Belgium Backgammon Team played 24 matches to 13 points against 6 other countries : Greece, Norway, France, Sweden, Gibraltar and Turkey. We only won 11 of those. That’s bad, right? Not quite. Let’s hear what Johan Huyck has to say about this. Johan is a professional math teacher and responsible for data processing in the BMS Committee. Johan (middle), setting up his recording equipment against Norway. Johan : We can look back on the tournament with pride. Sadly, Lady Luck was not on our side. M : Isn’t that an easy way out? Saying the dice were against us? Johan : No. Let’s look at it objectively : over the 24 matches we played a PR of 5,52, which is very close to the PR of 5,40 that we could expect based on the current BMS rating. Belgium was the best team in every encounter. Only France came close. This means that based on performance, we could, or should, have won every encounter. None of the encounters yielded a fair result. M : With fair you mean that the team who played best also won? Johan : Right. Of the 24 matches we played, 20 times the Belgian player played better than his opponent. Still we only won 11 matches. Our performance was also very consistent. Our worst PR in 24 matches was PR 7,89, whereas in 10 ( = ten) matches our opponents played an 8+ PR. M : I agree. I saw it happening on the boards with my own eyes. You cannot lose a match against a player who plays worse without having some brutal swings against you. Losing these 5 matches is “very unlucky”, I would say. M : Sure. Do you think we were among the best teams? Johan : I think there is a fair chance that only Denmark and Germany performed better as a team than we did. Maybe France also deserved a place in the Final Four. But of Norway I am not so sure. M : Hm… The UK maybe? And I think you are a bit harsh on Norway. A batch of 52 EP ( = four 13-point matches) is not really big enough to base a final evaluation on, right? And let us not forget that one of their very best players, Elias Kritikos, did not play against us. Johan : OK, you have a point there. But let’s look at it in another way : if we were to award points based on performance and we agree that 2-2 would be a fair result if PR’s are within 1, we would be expected to have scored 19 victories out of 24. If a draw would be fair with PR’s within 2, we would have scored 18/24 and if we agree on a draw with PR’s within 3, we would still be expected to reach 16,5/24. In short, there is no doubt in my mind that 13 losses and 11 wins is a very unfortunate outcome, especially knowing that 14/24 would always have ensured a ticket for the Final Four. M : I see. Anything else you want to highlight? Johan : Well, Marc’s performance was really outstanding of course. His overall PR of 4,28 (!) surely ranks among the 10 best performances of the whole championship. Marc (middle) before the Belgium v Turkey encounter. And you did well too, of course, with a PR of 3,25 (3 x 13) on Day 2. Walter also played within his skill window, which is something of a feat if you know that his luggage had stayed behind in Brussels Airport. It is not easy to play well if your mind is burdened by worry. Me and Johan (Segers) feel we could have done better. We played slightly worse than our acknowledged skill level. All in all, I think we did very well as a team and have lots of positive things to take with us to the next EUBTC. M : Any idea when and where that will be? 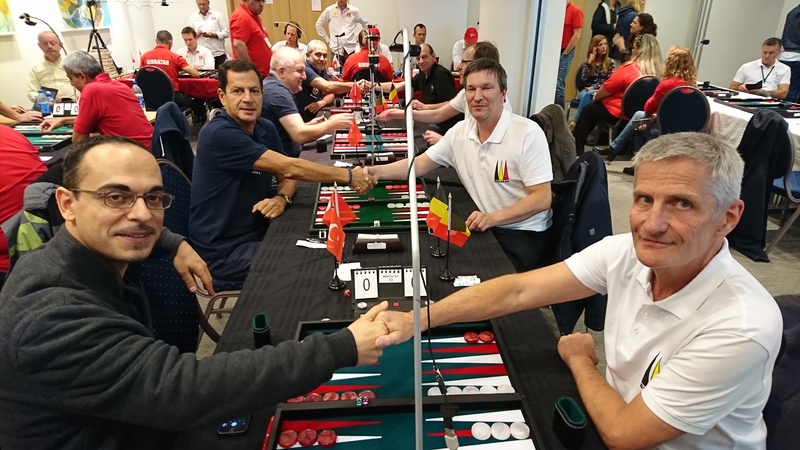 Johan : It was decided that Gibraltar will host the 2018 European Backgammon Team Championships in the first weeks of July 2018. We can be sure that the organisation will be excellent, as the organisers are quite experienced. Let’s hope we can send a strong team and play as well as we did in Reykjavik, maybe even a bit better. M : How can we ensure this? Johan : By keeping up the study and dedicated practice. And the good spirits. I feel that we stand a fair chance of reaching the Final Four, if we can only be spared some extreme bad luck. Ok, let’s conclude with a quote about ‘success’. Sadly, most have something to do with “overcoming failure” and I think it is clear that we did not fail in Iceland. Maybe Pele sums it up best : “Success is hard work, perseverance, learning, studying, sacrifice and most of all love of what you are doing or learning to do”. Thank you, Johan, for the insights. This entry was posted in EUBGF, Tournaments and tagged European Team Championship, Reykjavik. Bookmark the permalink. 3 Responses to EUBTC 2017 : Did Belgium fail? Are you really sure you want to name and shame fair playing opponents here? Backgammon is primarily based on luck in the short term of a tournament. Every decent backgammon player knows that. Error rate clearly is not all that matters in this game. Yep, Rogier, we are sure. Transparency is our motto. Pr’s tell us how well (or badly) we played. If you played well, good for you. If you played like a beginner, face the facts. And, yes, we know that luck is a big factor and we do not grudge our opponents their luck. We just do not want to give them ground to claim that they played better – which they manifestly did not. Thank you Michel for your answers and insight. You know that I value PR different than you do. We have discussed this before. I rather make a grave blunder in the beginning of a match, then a slight error in an eventual DMP. The last one would have a far better PR score, but it could be very costly in the match. To me PR is not all there is. I want the maximum win percentage over my opponent. But that is just me.